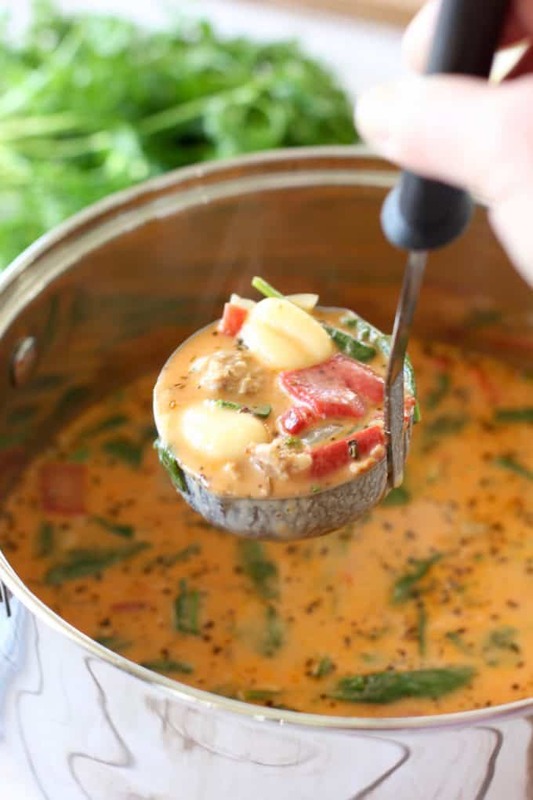 With just a few simple and wholesome ingredients, you can make this most amazing and comforting Gnocchi Sausage Soup in less than 30 minutes! We love this soup for so many reasons. First because it tastes good! Close second, it requires very little effort. Made with simple ingredients that come together in a big way. 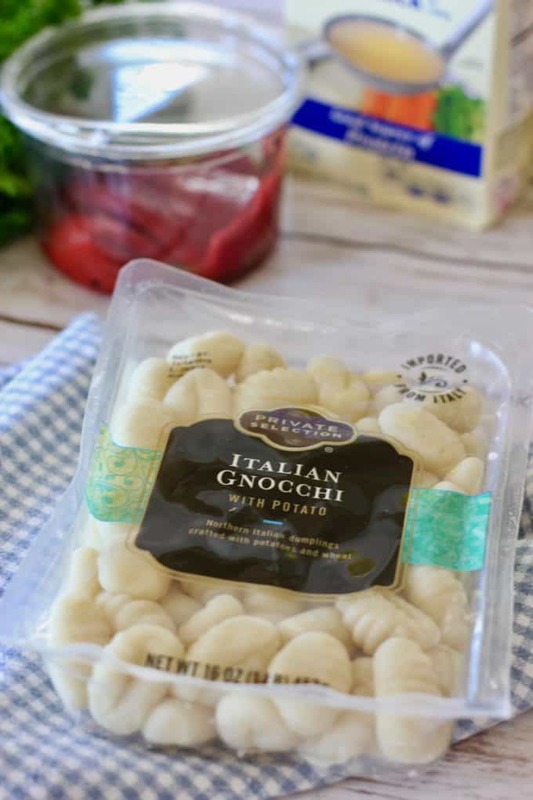 Gnocchi is readily available in stores these day. You will find it in the pasta aisle. I found this at my local grocers and paid 1.99 for it..a nice surprise. I remember when it was closer to six bucks. BUT, if your not a fan of gnocchi or can’t find it, rotini noodles are a great sub. Sausage: We used mild italian style. Easy to find, easy to use. You can sub chicken sausage, spicy sausage, just about any kind of uncooked sausage. 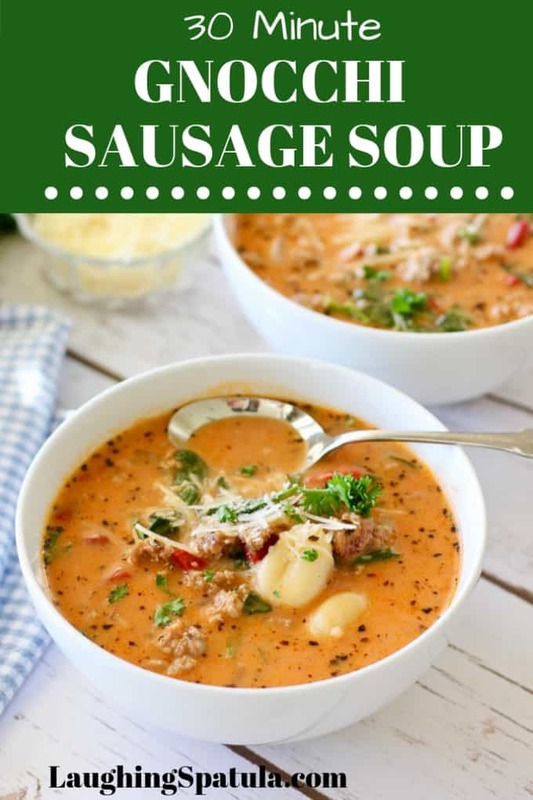 NOTE: As much as we love smoked, cooked sausage I find the smoky flavor doesn’t pair as well with this soup as uncooked sausage. Once you have sautéed your sausage and added the veggies, there isn’t much left to it! I like heavy cream but I have made this with half and half and have gotten great results. Sub great add-ins would be chopped carrot, celery, regular red pepper in lieu of roasted. The sausage does most of the seasoning for you. It enhances the broth and cream…so the better the sausage, the better your soup! SALT: I didn’t give specific quantities of salt because if you use low sodium broth or very salty sausage it will vary greatly. Your taste buds are the best tool for this. Love my job! 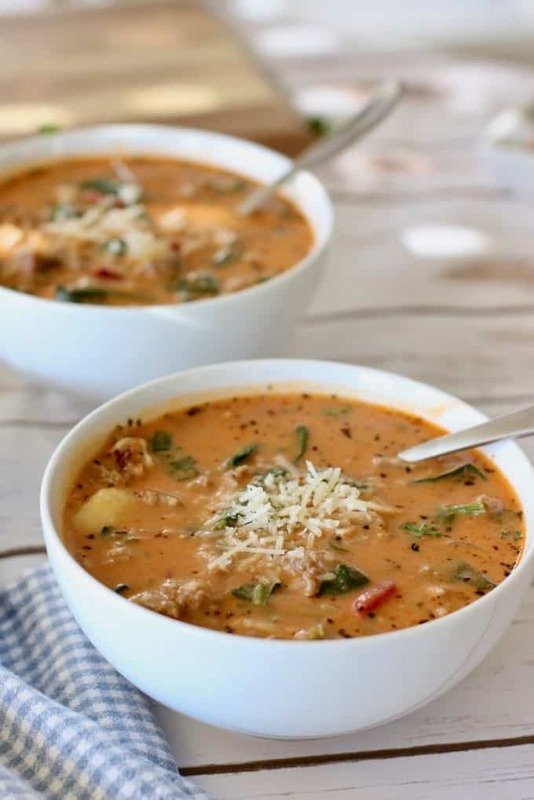 We have a over 40 easy, fast and fresh soup recipes to share with you! You can see them all HERE! To soup! The fast, the fresh and the flavorful! 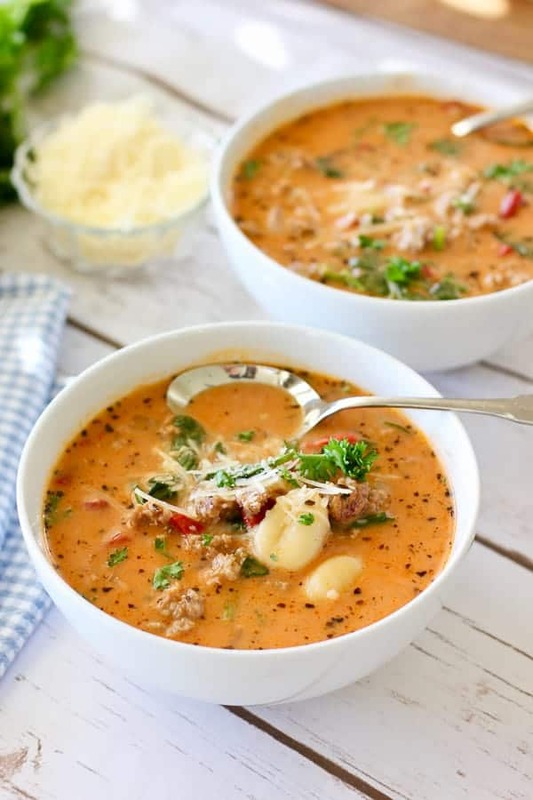 Simple and flavorful soup with sausage and gnocchi that comes together in 30 minutes! In a dutch oven or large soup pot, brown the sausage. Tipping the pan, remove all but one tablespoon of the grease. To the sausage add chopped onion. Sauce until tender. About 5 minutes. Add roasted red pepper, garlic and tomato paste sausage onion mixture. Saute until fragrant and tomato paste is incorporated into the sausage. Add chicken stock, cream and basil. Bring to a simmer and add gnocchi. Cook for 5-10 minutes or until gnocchi is tender and floats to the top. Turn off heat and add spinach. Let spinach wilt and serve! Top with a sprinkle of parmesan cheese and serve with fresh crusty bread and simple green salad if desired. Sausage: We used mild italian but any kind of uncooked sausage such as chicken or spicy italian will work. Gnocchi can be subbed with rotini noodles if you prefer. Jazzed this one up a bit. With the Italian sausage, I added shrimp and diced lobster tail meat to the mix and mixed a Mediterranean tomato sauce rather than just paste to the chicken stock. Added my needed spices to give it a kick. My wife demands it joins the regular rotation of the meals I cook for dinner. Thank you for the great foundation to work with! Shrimp and Lobster! Oh MY! That sounds heavenly in that wonderful broth! So glad you liked it and truly appreciate your nice note! This is legitimately one of my favorite comfort food recipes! I get hounded for the recipe every time I bring it to work for lunch. It is just that good! Made this soup today. Turned out amazing. Easy to make. Only thing I would change is adding zucchini. I think it would make it even better. I think zucchini would be wonderful in this! I’m so glad you liked it! 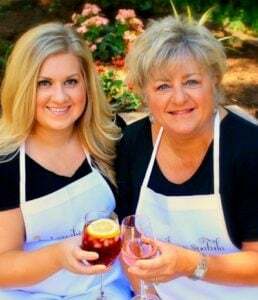 Thank you Kathi!!! Reading your post made me chuckle & I needed that dose of humour (& no, that is not the wrong spelling! It is the way the British spell it:)) today. Great recipe btw!!! Thanks Maria! Glad to know someone gets my humor! LOL! This looks amazing. Does anyone happen to know the nutritional information, or amount of calories per serving? This is so delicious! I made it for dinner tonight. It will definitely be in heavy rotation this winter. Thanks Molly! I love this soup and still make it all the time! Hey Kathi. We do not have 1/2 & 1/2 in Australia and rather than your suggestion to use heavy cream in it’s place which I’d prefer not to, can I use reduced fat milk only or would coconut milk suffice or ???? 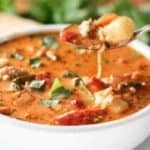 Recipe sounds so yum and as I just discovered your site, will certainly love to try it when weather gets a bit colder as now in mid-January here[mid-summer] and is a touch warm for soup!! Looking forward to your next email and thanks, wishing I’d discovered your site a long time ago. Half and half is half milk and half cream. You can make your own! I wouldn’t recommend milk alone…it will curdle and make the soup kinda murky. As far as coconut milk goes…yes. That will work. Just use full fat. Will drastically change the flavor though. This soup is really good without the cream at all also. Hope that helps! Is that roasted pepper from a jar or fresh? Either works great. I have used both. I like the jarred stuff from Trader Joes if you go that route. Thanks! Yes! that will be fine!